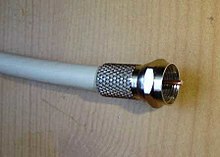 Coaxial cable uised tae cairy cable televeesion intae subscribers' residences. Cable televeesion is a seestem o deliverin televeesion programmin tae payin subscribers via radio frequency (RF) signals transmittit throu coaxial cables or licht pulses throu fiber-optic cables. This page wis last eeditit on 14 Februar 2018, at 18:33.